The Education Department arranges lectures and courses on a wide range of Shakespearian and related subjects for school and student groups. Under the Trust's 'Sharing Shakespeare' scheme, day schools are organised on Shakespeare's plays for school and college groups, comprising talks, workshops, video extracts, and sometimes a theatre visit. The Trust and the Shakespeare Institute collaboratively organise short residential courses, ofa few days or a few weeks in length, for student groups from British and overseas universities. The courses concentrate on the current RSC repertoire and teaching by the Institute and Trust staff is augmented by classes with members of the RSC. The Library comprises the combined collections ofthe Birthplace Trust and the Royal Shakespeare Theatre. It contains over 40,000 books and other items, including maj or theatrical archives, which cover many aspects ofShakespeare's life, work and times and the history of his plays on the stage. 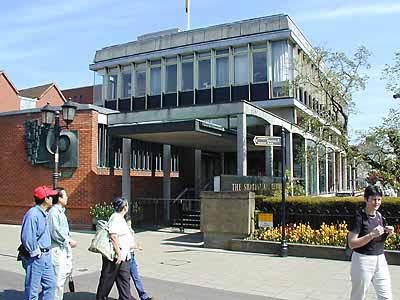 The Records Office is the local history study centre for Stratford and the surrounding area and holds extensive and varied collections of maps, prints, photographs and other documents which illuminate many aspects of English history. Separate talks can be arranged for groups on the Library and Records Office collections, accompanied by small displays of books, documents or other material. The talks can either be of a general nature or focus on pre-arranged topics such as, in the case of the Library, the stage history of particular plays, or in the case of the Records Office, historical subjects such as transport development, law and order, the enclosure movement and welfare provision. Monday - Friday 10.00 am -5.00 pm. Saturday: 9.30 am -12.30 pm. Monday - Friday: 9.30 am -1.00 pm I 2.00 pm -5.00 pm.